I have NEVER been happy with how I've taught compound inequalities in the past. 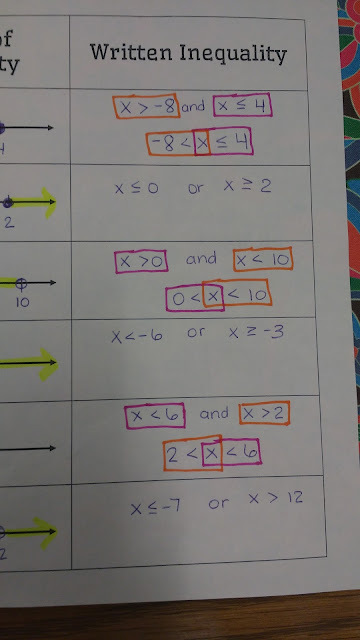 I've never really given my students as reason for why we need to even deal with compound inequalities in the first place. On the outside of the foldable, we did one example of an AND inequality and one example of an OR inequality. Before doing these examples, I had the students do a "Stand Up If..." activity. Stand up if you are wearing blue. Stand up if you are wearing shoes that have laces. Stand up if you are wearing blue or are wearing shoes that have laces. Stand up if you were born in November. Stand up if you were born in December. Stand up if you were born in November and December. That last one sparked a bit of a theological discussion I wasn't planning for. I asked my students why no one was standing up. One student told the class that it was impossible to be born in two different months. Another student piped in that it wasn't actually impossible. You could be physically born in one of the months and spiritually reborn in another month. Soon, students were talking about how some people don't believe in God. As much as I agree that you can be spiritually reborn, I've been hired to teach my kids math, not Christian theology. So, I put a stop to this conversation as soon as I could, and I made sure to use different examples the rest of the day! After I felt like my kiddos had a grasp of the difference between AND and OR, we looked at some "I am thinking of a number" problems. Before we did anything else, I had my students determine if each statement was an AND statement or an OR statement. The first one tripped them up a bit because it has both the words OR and AND in it. 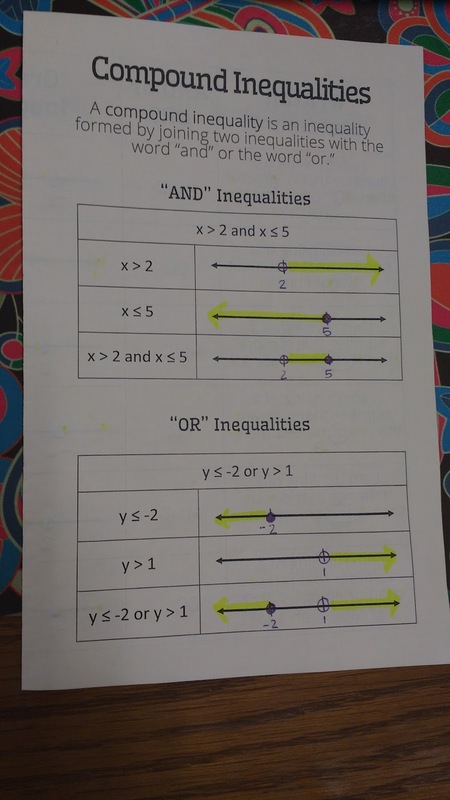 The OR, however, is part of "less than or equal to." 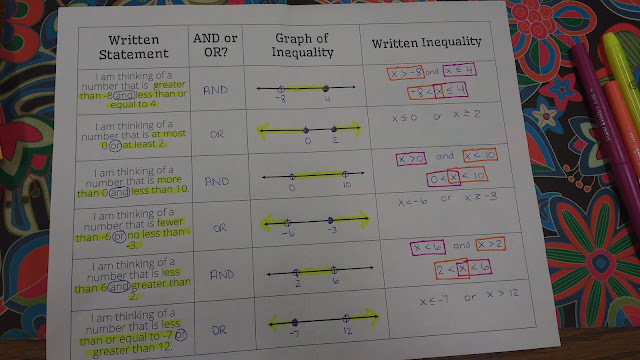 At first the kids think my trick is kinda lame, but then they start begging me to do the highlighter trick EVERY SINGLE TIME we shade an AND inequality. 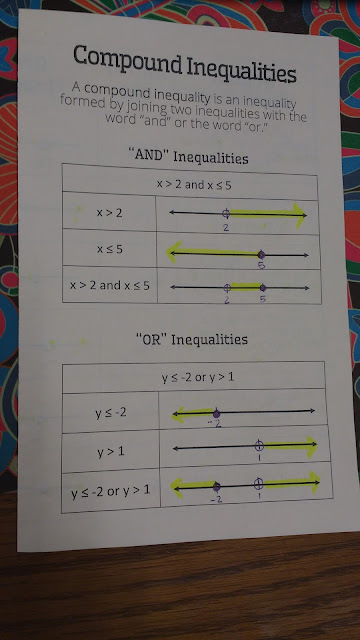 I also really like to emphasize WHY we can write our AND inequalities two different ways. This is something I've never really emphasized with kids before because I always thought it was just obvious. It may be obvious to me, as a math teacher, but it's definitely NOT obvious to them! One of these is still in the same order as it was written before. The variable x was written before the 4 earlier, and it's written before the 4 now. So, we can just bring down the less than or equal to symbol. Earlier, we had the variable x written before the -8. Now, -8 is written before the x. The greater than symbol must become a less than symbol to accomodate this switch. You can find the files for this foldable here. Another great post! 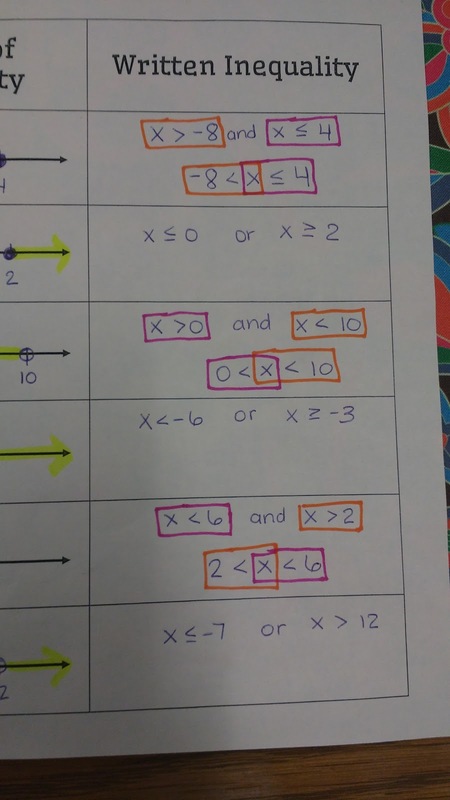 I can see kids wanting to do the highlighter "trick" on the SmartBoard - and it is a great visual! Keep these great posts coming! You saved my bacon AGAIN today- thanks for the foldable and the ideas. I wish you would write a math textbook. You are such a blessing. I have used so many of your resources in my class this year, and as a second year teacher, you are a life saver. Thank you so much for your generosity and talent. I could not get the video to work either... do you have a url for it? I love your posts -- THANK you so much! I haven't taught Algebra in years, so your cite has been a real Godsend. Thanks again for all you do -- and share!